1. Boil the potatoes for 7 minutes, then add the corn kernels. Bring back to the boil and cook for 3 minutes or until both are just tender. Add the peas, bring to the boil for 1 minute then drain and set aside. 2. Rub 2 tsp mustard through the breadcrumbs until even. Dust the fish in the seasoned flour, then brush with the yogurt. Press each fillet into the crumbs to coat. Heat 1 tbsp oil in a heavy-based frying pan and fry the fish for 3 minutes on each side, or until golden and crisp, pressing the fish down now and again with a fish slice. 3. 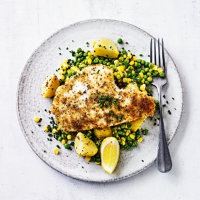 Stir the remaining mustard, 1 tsp oil, lemon zest and 1 tbsp juice into the warm potatoes, corn and peas. Season then serve with the fish, chives and a wedge of lemon. Cook’s tipFor fresh breadcrumbs process a slice or 2 of crustless bread or pick up a bag of Cooks’ Ingredients Soft White Breadcrumbs. This recipe was first published in Tue Jul 03 08:34:00 BST 2018.